The former Wesleyan Methodist Church at 66 - 76 Palmerston Street, Melton is significant as a moderately intact example of a Victorian Primitive Gothic Revival style and as an historical legacy of the development of the Wesleyan Methodist Church in Melton in the nineteenth century. The former Wesleyan Methodist Church at 66 - 76 Palmerston Street is architecturally significant at a LOCAL level (AHC D.2, E.1). Although there is a recent small gable addition at one end, the Church building still demonstrates original design qualities of a Victorian Primitive Gothic Revival style. These qualities include the parapeted steeply pitched gable roof form and coursed, squared rubble bluestone wall construction. Other intact or appropriate qualities include the corrugated sheet metal roof cladding, pointed arched timber framed windows openings (albeit currently blocked up), and the small vertical lancet in both gable ends. The former Wesleyan Methodist Church at 66 - 76 Palmerston Street is historically significant at a LOCAL level (AHC A4, B2). It is the oldest surviving church in the Shire of Melton, and as an expression of the importance of religion in the period. It also represents the post gold-rush period of community consolidation in which many small bluestone buildings were erected in townships on Victoria's basalt plains. Its modest size and simple style probably reflect the size, beliefs, and affluence of the congregation that built it. Overall, the former Wesleyan Methodist Church at 66 - 76 Palmerston Street is of LOCAL significance. The former Wesleyan Methodist Church at 66 - 76 Palmerston Street, Melton, is set within an open grassed and gravelled allotment, with some plantings and a mature eucalypt at the side. A modern brick Masonic Hall is situated nearby the church, to its south. 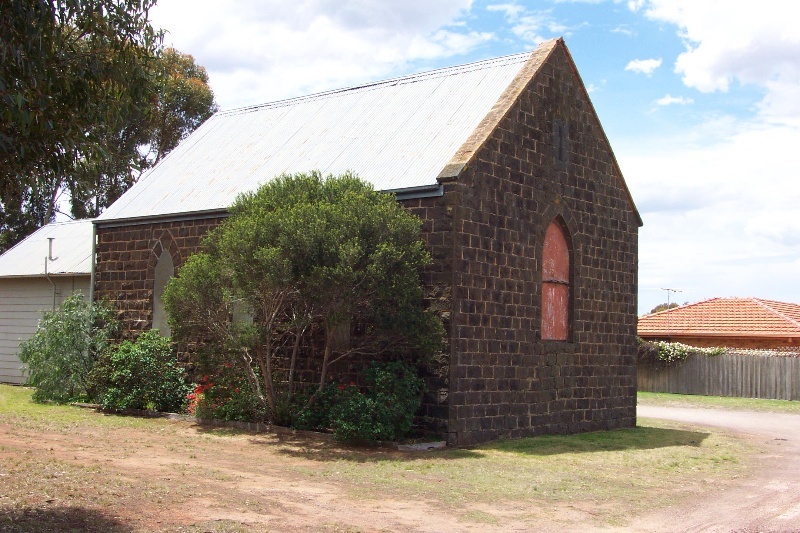 The modestly scale, single storey, coursed squared rubble bluestone, Victorian Primitive Gothic Revival styled church building is characterised by a simple, parapeted steeply pitched gable roof form clad in galvanised corrugated steel (which replaced a slate roof in recent decades). Early pointed arched timber framed windows have been blocked up with hardwood boards (one, possibly that which is now covered with a small weatherboard addition, was previously converted to a fire escape). Small early vertical lancet openings are situated in both gable ends. The stone toothing at the south (west) end of the church suggest that provision was being made for a future extension. To one side of the church building is a gabled addition. It has galvanised corrugated steel roof clad, modest eaves with exposed timber rafters, weatherboard wall cladding, two single door openings and a paired window opening. This store room addition obscure the original double door entrance to the church. The form of this small addition replicates the simple gable form of the church, and its materials immediately identify it as a distinct addition to the original. The interior has been extensively renovated, there is a dropped ceiling and the walls are lined with plasterboard. Two large airconditioning units are attached to the eastern wall of the church. Externally the stonework is showing signs of deterioration with a great deal of mortar missing. National Trust of Australia (Victoria), File No. B3180.